With sharks, one of my favourite creatures in the sea. I have played hide and seeks with an octopus before and it was FUN. 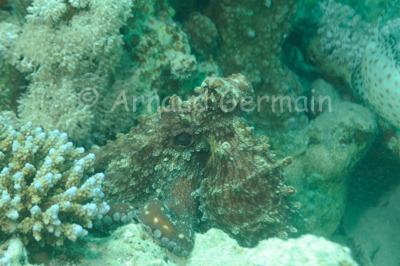 This one was by the mooring line, in Marsa Shagra bay and was quite relaxed despite the 3 divers looking at it. It changed texture and colour several times, still keeping an eye on us. I managed a whole series of pictures. Nikon D700, Nikon 28-105 mm macro at 80mm, F5.6, 1/160th, ISO 200, Ikelite Housing and Ikelite DS160 strobe set on TTL. Marsa Shagra Bay, about 8 metres down, Marsa Alam, Egypt.